KAWASAKI CONCOURS LED KIT SoCalMotoGear.com - Professional Grade Motorcycle Lighting - Plug N Play Products - "Riding at night has never been brighter!" The Position LED bulbs replace your dull stock yellow looking bulbs to bright white and matches the LED headlights. This kit will enable you to have High Performance LED Headlights and INCLUDES LED Position lights that will replace your dull factory lights. These Position bulbs replace your center lights between the main headlights [50 watt equivalent brightness/low amp draw]. The amp draw on our headlight LED bulbs are 1/3 the power of standard incandescent bulbs but outputs a much brighter light. 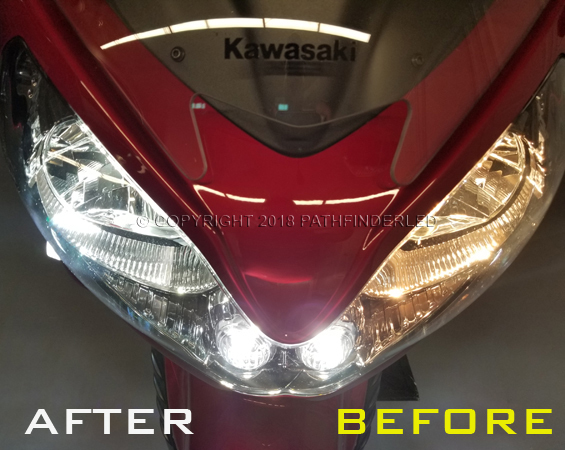 Complete the front end of your bike with these PathFinderLEDs to give it a nice clean light output while promoting extreme visibility. 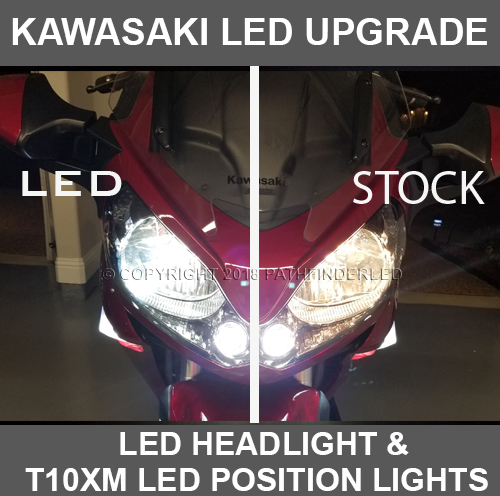 Our lighting undergoes rigorous testing and has been road tested on Kawasaki motorcycles. Don’t be fooled by cheap knock offs with similar looking designs as those products can overheat prematurely. WATCH YOUTUBE INSTALL VIDEO BELOW. Product is a tremendous lighting upgrade. Do NOT waste your money on Phillips halogens as some suggest...mine only lasted 9 months and did not provide any additional light, they just provided "whiter light". The PH4 LED's from SoCAL provide MUCH brighter down-road illumination than stock. Easy to install and a must addition to any stock bike lighting. This purchase exceeded all my expectations. Very happy with this purchase. Mother in law bought as an early Christmas present. I had a slight concern with wiring on the LED driver. I sent a picture along with an email highlighting this to SoCal, promptly got a response and a replacement no further questions asked. Product is awesome! Not only performance with down range visibility but completely changes the look of the bike (C-14/1400GTR) giving it a more modern look. Before carrying out any mods to your ride, consider this simple cheap upgrade first! Many thanks, SoCal! These lights look fantastic and light up the road, signs, & reflectors very brightly. I had a couple issues with the installation and had to email SoCal. They responded to my emails within 30 mins (usually faster) every single time. They walked me through the issue I was having. They absolutely went way above and beyond. I'd HIGHLY recommend them for all of your needs. I had read some very positive reviews on the Concours Owners Group website, so decided to give the combo kit a try. Wow, what a difference in light out put as well as ease of installation. Plus, I think it makes the front of the bike look really cool and it does grab the attention of the cagers. Overall, I would highly recommend this product and a great addition to the bike.